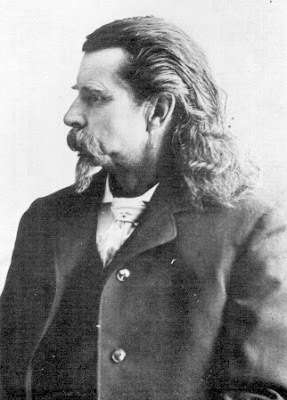 Portrait of the Artist As A Frontiersman: Joseph Bevier Sturtevant. 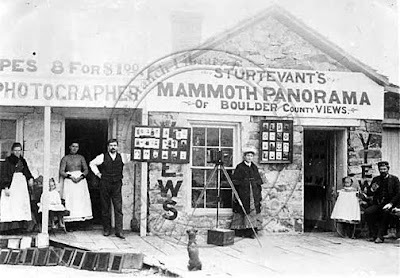 Joseph Bevier Sturtevant was a prolific photographer who settled in Boulder, Colorado in 1876. That much is certain. On December 30,2009 according to the online Colorado Daily, Boulder's Carnegie Library got nearly 1,600 pictures to prove it. The photos, donated to the local history collection, are in black and white, but they were taken by one of the Colorado city's most colorful citizens: a fraudulent frontiersman known as "Rocky Mountain Joe." Most of Joe's local color was carefully applied by the man himself, to disguise the drab canvas of an ordinary life. He lived by the words of the reporter in John Ford's ode to the end of the frontier, The Man Who Shot Liberty Valance (1962): "This is the West, sir. When the legend becomes fact, print the legend." Rocky Mountain Joe, Hero Of His Own Life. According to his highly inventive--and invented--autobiography Joe's life was the stuff of dime novels: one thrilling, cliff hanging, death defying, adventure after another, each more spectacular than the last. The irony is that a man who recast his life as a transparently tall tale ended up being remembered for his genuine ability to capture reality with a camera. The man who became "Rocky Mountain Joe," buckskin-clad son of the American West, was born a bourgeois Bostonian in 1851. Joe later insisted on Illinois as his birthplace, washing out the starch of a proper background. Once he Westernized his native geography, Sturtevant continued full steam ahead, ceaselessly creating wildly entertaining, if completely fictional, accounts of his childhood, adolescence, and adulthood. Mutual Admiration Society: Joe The Artist Meets Joe The Critic Via Double Exposure. Depending on which yarn Joe chose to spin, the pioneering Sturtevants crossed the Great Plains to California, staking a claim and striking it rich in the 1849 Gold Rush. Or maybe the intrepid clan never made it to California: their wagon train was waylaid, and the entire family massacred by renegade Chippewa. Only Joe was miraculously spared, becoming the adopted son of the Chippewa Chief. Or perhaps the family settled in Wisconsin, where his "Indian Trader Father let the peaceable Chippewa" raise him. In any case, Joe never failed to credit his Native American captors/mentors with making him a crack shot and an expert horseman. Those somewhat suspect skills supposedly served him well in the next stage of his literally unbelievable life. When Joe's father Samuel, died in 1859, the eight-year-old, who apparently wasn't in Chippewa hands, was apprenticed to a broom-maker. But the only straw Joe ever admitted to handling was the kind he could spin into gold. So he eighty-sixed broom-making from his resume, and replaced it with every 19th Century boy's dream. In the new and improved version of Joe's childhood, the fatherless boy ran off to join the circus. But even "The Big Top" wasn't big enough for Joe, so at the ripe old age of 10, he left all 3 rings behind to join the army. No military records exist to verify Joe's service in the 4th Wisconsin Cavalry, but one of his brothers did join the regiment. The straw man shamelessly swept up his sibling's service, and claimed it as his own. Paint Your Wagon: Joe's Wife, Anna, And Their Children Minding The Store. As the not-so-steadfast boy soldier tells it, he risked life and limb in the Civil War, braving battles in Louisiana and Alabama. After safely settling that small skirmish with the South, he headed West to sort out the Sioux. That terrifying tribe captured him not once, but twice. The first time staking him to the ground in preparation for burning him to death. Only a fortuitous rainstorm foiled that plan for his dastardly death. The second go-round with the Sioux saw Joe surviving "two years of hellish captivity," escaping from Sitting Bull himself by miraculously floating down the Missouri River. He finished off his epic wartime escapades as "an Indian Scout extraordinaire." Weary of war, Joe aimed to put down roots in a city he'd visited while on recon for the regiment: Boulder. 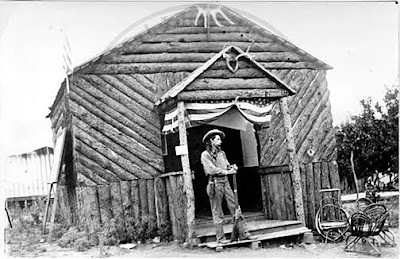 Arriving in the Colorado city decked-out in full frontiersman finery, Joe bolstered his bogus backstory with fringed buckskins. Postcards From The Edge: Rocky Mountain Joe's Lavish Emporium. 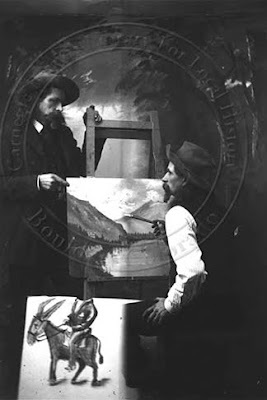 In 1884, Joe invested his hard earned cash in a mechanical portrait painter, the camera. 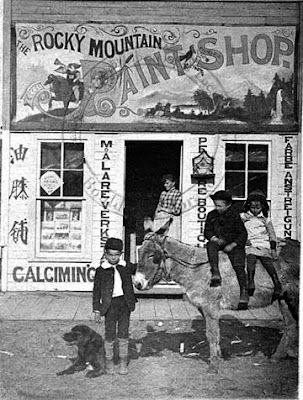 Quickly mastering the new invention, he was soon selling photographic postcards for the extravagant sum of 10 cents each. Over the next 16 years, Joe shot hundreds of glass plate negatives, from which paper prints were produced. He became renowned not only for his portraits, but for capturing catastrophes such as train derailments, streetcar accidents, and blizzards. All of his negatives were donated to the Boulder Historical Society in 1910. That was the year Joe had his last, rather mysterious adventure. No Business Like Joe Business: Joe's Atmospheric Studio At Chautauqua, Above Boulder. Joe's first wife, Anna, died in 1904. The marriage was a happy one, and produced five children. Seeking a stepmother for his brood, Joe unwisely wed a hot-tempered local cook. She proved violently jealous, unable to abide Joe's financially motivated flattery of his female photographic subjects. Shortly after leaving his increasingly unhinged second wife, Joe took a short trip to Denver. After paying a visit to his son, he boarded the train for home. For some reason, perhaps due to a lost ticket, he left the train to hike back to Boulder on foot. What next befell him remains a mystery. After being reported missing by his worried children, Joe's mangled body was recovered from the bottom of a rocky ravine near the train tracks. The self-styled mountain man had fallen, jumped, or been pushed from the high ground to his death. 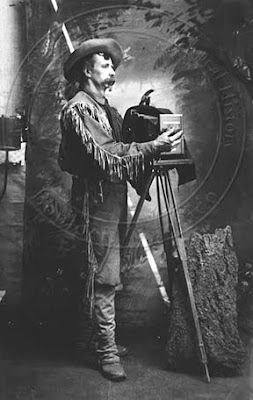 The flamboyant frontier photographer who invented such a flagrantly false persona is now famous for the drama of his pictures, not his life. Sturtevant developed a distinctive style that allows modern researchers to easily identify his work. His sense of the theatrical, combined with an artist's instinct for superb composition, turned photos taken for 10 cent postcards into a priceless visual record of the taming of a frontier town. The paper prints of Sturtevant's shots, now in the Carnegie Library's vaults awaiting digitization, were salvaged from an estate sale in 1985. The donor, City Councilman George Karakehian, estimates their value at "anywhere from $20,000 to $40,000," but gave them to the Local History Collection to ensure "availability for future generations of researchers." "Rocky Mountain Joe" might find such generosity foolhardy. But it has given him one last curtain call: our hero, Joseph Bevier Sturtevant, king of the wild frontier.